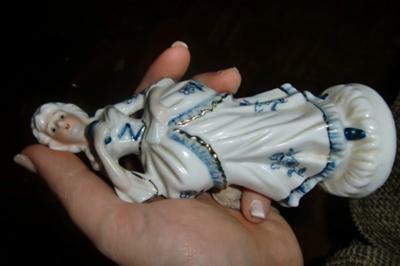 I came across these lovely Blue and White figurines in my Grandmother’s basement. I have spent a lot of time online trying to find out about them, but I have no idea whether they are valuable heirlooms or just cute figures she found at a garage sale. 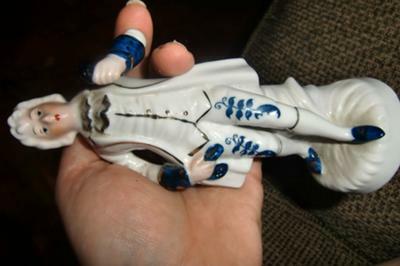 The Blue and White Figurines have gold accents, and are a man and woman. They have a black PB stamp on the bottom with a crown over the top of the initials. As grandmother is no longer around to ask about them I would SO appreciate ANY information anyone has regarding them. In 1878 Henry and James Doulton acquired a major interest in the Pinder, Bourne factory in Nile Street, Burlsem for an investment of £12,000 and eventually changed the name to Doulton & Company, Burlsem in 1882. 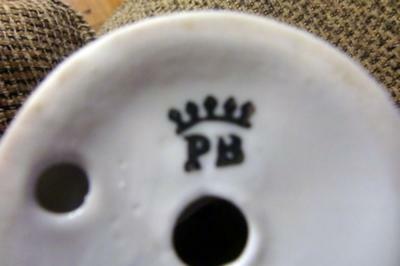 They continued, initially, to use the existing base marks of PINDER BOURNE & CO and/or the initials P.B. & CO or just P.B. However, I doubt these are early Doulton or Pinder Bourne, by any stretch of the imagination. Even though PB did produce Blue & White porcelain wares the quality (even though the images don’t show great detail), appears to show poorly modelled figures lacking detail in the hands and the facial expressions. A closer examination may say otherwise. The PB makers mark is also very poorly done where Pinder & Bourne marks are quite ornate. Without a closer look these pretty Blue and White figures are probably reasonably modern. Probably European continental productions not worth more than a few pounds; unless another reader can shed more detail on the makers mark.